GIS Services is part of the Information Technology Division. 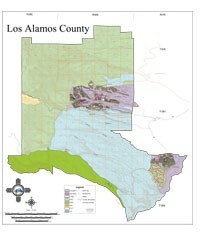 The general mission of the GIS program is to support Los Alamos County government with geographic information technology for analysis and decision-support as itpertains to geospatial information. Check road conditions and weather advisories in New Mexico by using this interactive web application. Provides access to data, training, and technical support for geographic information users, as well as those who desire to incorporate geographic information into their processes and applications. Find out how State department is striving to position New Mexico as a national leader in the energy and natural resources areas. Find out more about New Mexico from the Bureau of Land Management. The geographic information available from The National Map includes orthoimagery (aerial photographs), elevation, geographic names, hydrography, boundaries, transportation, structures, and land cover. Find out more about the U.S. space-based radionavigation system that provides reliable positioning, navigation, and timing services to civilian users on a continuous worldwide basis -- freely available to all.